Posted by Arun Rajagopal in Conversations, Marketing, Oman. 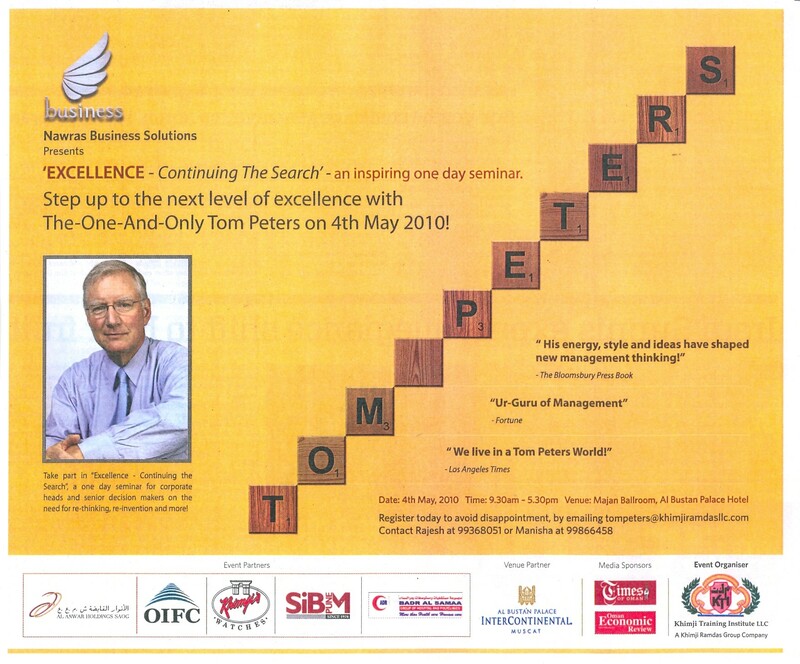 World-renowned Management Guru Tom Peters will be in Muscat on 4 May 2010 for a one day seminar on ‘Excellence – Continuing The Search’. The seminar is organized by Khimji Training Institute LLC and presented by Nawras Business Solutions. Tom describes himself as a “gadfly, curmudgeon, champion of bold failures, prince of disorder, maestro of zest, professional loudmouth, corporate cheerleader, lover of markets, capitalist pig.” (An impressive bio by all means). When he wrote his best-selling book ‘In Search of Excellence’ with Bob Waterman over 25 years ago, Tom was the first to introduce the corporate world to the concept of Excellence which is today a universal idea-ideal that translates and transports across all borders. In 1999, ‘In Search of Excellence’ was honored by NPR as one of the “Top Three Business Books of the Century”—and ranked as the “greatest business book of all time” in a poll by Britain’s Bloomsbury Publishing. Don’t think of Excellence as a “lifelong aspiration.” Forget that! Instead: HOW CAN I EXPRESS EXCELLENCE IN THE NEXT HOUR?? Reflecting on that, I think we focus so much on the future that we lose sight of the present picture. We think we will strive for excellence in some big action in the future while we can do better by applying excellence to an action right away. Yes, so it’s better to focus on excellence with a sense of immediacy in everything we do, however minute or mundane the task may be. This is Tom’s second visit to Oman and I wish him & the attendees of his seminar an excellent and productive session. I also hope that the ash cloud over Europe dissipates in time so that he doesn’t have to circumvent the globe to get to Muscat. Tom is widely credited with almost single-handedly “inventing” the “management guru industry,” now billions of dollars in size. Since 1978, he’s given well over 2,500 speeches, flown 5,000,000+ miles, spoken before 2-3 million people and presented in 48 states and 63 countries. Tom was the first guru to stress on the importance of design as an extraordinary competitive advantage. He was also the first to voice the need for employees to re-shape their careers around the idea of “brand you” (every person a “businessperson”) if they were to add useful value to their firms and survive the perils of cutthroat global competition. You can read more about Tom Peters by clicking here. when is Tom Peters expected in Oman? As per an ad released in Times of Oman today, Tom Peters will be in Muscat for this seminar on 3 Aug.